Yesterday saw the very first 'State of Play' presentation from Sony, a new video presentation series which will cover PS4 announcements going forward. Although Sony never described it as such, many immediately compared the series to Nintendo's 'Direct' video presentations - a format with which we're sure you're already very familiar. The show failed to live up to the same levels of hype people expect from a Nintendo Direct, but all things considered, it does have the potential to evolve into something just as exciting for PlayStation players going forward. 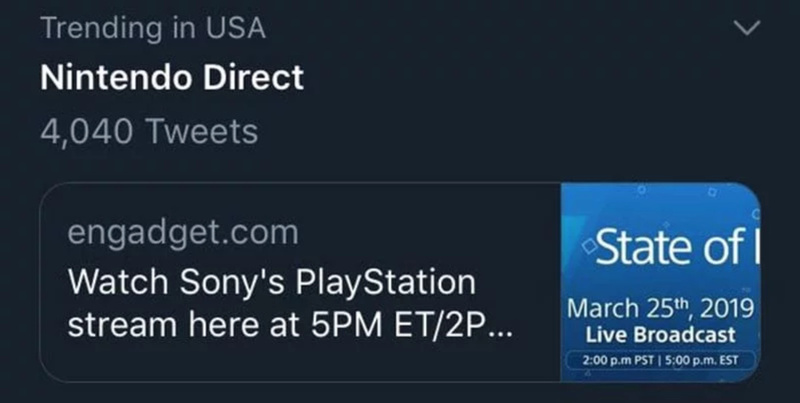 These promising signs were overshadowed online, however, as - mostly negative - comparisons to Nintendo's broadcasting series came flooding in on Twitter, actually making '#NintendoDirect' trend on the social media platform. It's easy to joke about PlayStation copying Nintendo's ideas yet again - we've seen this several times before, as evidenced by our video below - but this one really does make sense when you think about it. Why wouldn't you want to try and tap into the success Nintendo sees with its Direct videos? Do you think regular videos like Nintendo Directs and PlayStation State of Play will continue long into the future? Could this be signalling the beginning of the end for events like E3? Let us know down below. I really liked the state of play livestream and I don’t mind sony copied nintendo here. Nintendo should be flattered, sony clearly gives the impression the nintendo direct format is a winning formula. Nintendo Direct is still more interesting. Sony streamed their Direct on the same day as Apple? That's dumb, all the media are writing about Apple today. Not worthy of an article but I guess that is the purpose of the "Random" tag. I'd like Sony to continue with this but they really need to up their game. Last night's State of Play was disappointing to put it mildly. I really love the fact that Sony is having its own kind of direct. I am sure that it will evolve to something better just as Nintendo's own directs did. Not long ago, directs used to drag with endless talking and especially for Europeans they had big trouble understanding Japanese speaking English without subtitles. No Man's Sky full VR support--nuff said. Well, duh. Sony releases a video presentation similar to Nintendo Direct. Ergo? Nintendo Direct confirmed! Thought it was a good presentation. Was definitely lacking in games but I'm glad they went with the format they did as opposed to Microsoft Inside Xbox. Hope they stick with it! I was hoping for an Iron Man game as a follow-up to Marvel's Spider-Man, but not as a VR game. Only thing I found interesting was the low-poly costumes for CTR: Nitro-Fueled, but I was gonna buy it on PS4 anyway, since I already own N-Sane Trilogy on that system. Beyond that, nothing really stood out, except for Concrete Genie, but of course that has to be VR compatible too. I was proper underwhelmed, mostly because it was more of a 'VR' State of Play, but at least it was something from Sony. There has been a complete lack of communication from them in recent times and it is a format that can be used to improve that. Forgot this was even a thing as I haven't seen anything about it all day till now. I get eye cancer from that Sony/Switch crossover pic. Copying awesome ideas is always smart. Nintendo Direct has been a feature from Nintendo and they have been using it for several years now. Considering how the players seems to love these presentations, it’s very easy to understand why Sony would want to get in on the ride. On the side note, I missed the broadcast as they never really reach out to me in a way that catch my attention. Nintendo always send me emails about upcoming Nintendo Directs, and as they don’t send me too much trash emails, I always notice. Sony does however send me several trash emails with no real information and that has caused me to ignore or just barely glance at their mails. They should learn not to overuse the fact that I have email notifications on. Just send me mails when you’ve actually got something Sony! Learn from Nintendo’s carefully chosen number well made emails, that would do you good. I don't get these 'it will evolve' comments. It's a video with trailers for upcoming games. If good games are shown, gamers will think it was good. If they're not, we won't. No evolution necessary. It wasn't bad. They just need some devs on board to go into more detail about the games, a presenter to be the face of State of Play, and maybe a surprise reveal at the end to get people talking. It was an alright first go and I think they'll improve in future presentations. This is honestly pretty funny. Nintendo isn't the first company to release videos about upcoming products but the similarities are clear here. Nintendo Directs tend to work because there is a lot of variety about them that rarely outstays it's welcome- Here's the Mario game- here's an indie puzzler- here's a retro re-release- here's a new Doom game- Now some amiibo- Smash is getting DLC- More info on Fire Emblem. Lots of different games, different genres, with different aesthetics. PS4 has far less visual variety (admit it, there is a lot of brown and grey in sandbox games), and at the moment there's very little to talk about beyond VR before the PS5 comes out. To me it would make more sense in saying 'were going to talk about this one game of thing for 10 minutes' for those that are interested in that thing. Watched the State of Play and this was just a trailer reel. No indepth gameplay, no further explanations, just trailer, two sentences, next trailer. It was a bit more barebones and while yes the Nintendo Direct are also trailer reels, usually it's followed up by some additional footage with a bit more about the game, what to expect, what genre and what not. It's hard to put a thumb onto it, but since there was only voice over, it had the less charming feel that a Nintendo Direct had. Well from what I've seen and heard Sony failed to impress. But I have absolutely no interest in VR. Their main issue was that they've got nothing worth making such a "Direct" for. They should've started doing this with the ps5 probably. Nothing really caught my attention. But it was a first attempt, so I guess we will see how it goes from that. Now I’m ready for a Nintendo Direct. Sony's current state of play is pretty dull. Until PS5 there's nothing not already know. Unless you're into VR. Good they are keeping to it. It's not like Nintendo Directs are that great... the horrible translator voiceover and dead atmosphere make it almost cringeworthy. Reggie and Iwata were the only thing that made the Directs interesting, aside from the occasional gem of a trailer. I hope you delete or update this article ASAP given it’s the definition of fake news. Notice how only 4000 tweets caused Nintendo Direct to trend. This is because it’s not actually trending. Rather, in your twitter community and based on your interests, Twitter’s AI decided it should trend for you. For some, neither PlayStation nor Nintendo was trending. For others, just PlayStation was or perhaps both. It has nothing to do with the global effectiveness of the announcement and everything to do with its effectiveness among people you follow, people who follow you, and people who use the internet similar to the way you do. Which is going to be biased toward Nintendo in your case. I have Switch and PS4, but found this presentation disappointing. Pretty much it was all about VR. Was hoping for some remaster announcement from BluePoint Games, who are the best when it comes to remasters. But nothing. This is fine. 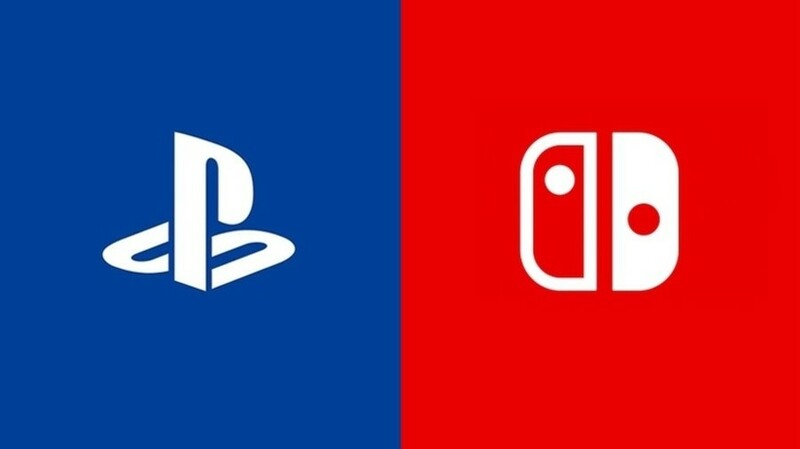 Sony should keep doing them and improving, and we will get a little competition going which probably make them both improve. Nintendo completely bucked trends when it started and Nintendo Direct will always have that initial ingenuity and Iwata charm that fans — maybe irrationally — get a little protective about. @riccyjay For what it's worth, even Nintendo Directs evolved over time. Dev interviews have either been cut short or eliminated all together, because they're unecessary fluff for the Directs themselves. They also learned to categorize the types of Directs and even when to not make something a Direct at all (Labo) to temper expectations. Wasn't my cup of tea, but I think the format is OK, and Sony will have a lot more to show off once they've properly launched the next generation. Also, as mentioned, Nintendo Directs weren't originally this sleek and effective. Give Sony a bit of time to grow into the format. Also, let's ditch the "Sony copied Nintendo!" talking point. It's childish and meaningless (people borrow ideas from other people all of the time; that's how societies evolve). @Heavyarms55 I've seen you mention that point before, but it's a bit more nuanced than that. In general, it's true, but Nintendo is the first video game company to do it, and do it in a very specific manner and format, and THAT is what makes them the first and the most innovative, to some extent. Having said that, I do wish them good luck going forward with this, seeing as presenting your hardware and software in this way, is the best solution for reaching your intended audience nowadays, as both the Nintendo Directs and Inside Xbox streams have already shown. As someone who has PS VR, this was a pretty good presentation but if you don’t own one and not interested in vr, this was not a good one. Sony needs to either balance with half being vr and half non vr games or specify that it’s a “state of play vr edition” much like how nintendo does with their nindies event. Makes me, once again, consider buying a PSVR. NMS in VR will be lovely! @DTFaux That's a fair point. The presentation could be made better or worse. However, it wouldn't matter how much they jazzed this one up, the lack of any particularly interesting announcements was always going to sink it. Ultimately, every Direct or State of Play will stand or fall based on one thing only: what games are in it. I'll give Playstation credit: the name is a little more creative. I am all for Sony doing this, and who cares if they copied a good idea? However, that "Direct" was simply not good. Too much VR and nothing about the games people have been waiting for - Death Stranding, Ghosts of Tsushima, Last of Us Part 2, Cyberpunk 2077. Right now, Days Gone is the only upcoming Sony game I care about that even has a release window. Sony in their next State of Play really needs to split up PSVR and PS4 into 2 separate sections of the presentation similar to what Nintendo has done with 3DS and Switch presentations. Sony also should have a bombshell announcement at the beginning and the end, and by an announcement I do not mean announcing a few small things for a game that was already known about. @manu0 no, I mean "State of Play." They changed red to blue. Massive meh from me. I don't remember them going into any details like Nintendo do. Which is a shame. Nintendo's treehouse (for me) is the best part of E3. I didn't realise they were pushing VR so much. I suppose they are coming to the cusp of the PS4's cycle, so don't have too much in the way of hype builders maybe (which begs the question was the timing of this wrong). But with new tech giants entering the industry, I suppose they need to carve their own place and VR seems to be their own space. If they are going to live by third party software, they will die by it! Directs are successful because of expectation and anticipation. This 'SoP' was yeah, soppy. Weak. They copied the format well enough, but they don't quite get the execution. I tuned in wanting to be interested...and I'm not just being a Nintendo fanboy when I say... it was really really sad. Like I was legitimately sad for them. The live chat was brutal too. I like that they went full Direct with it, it's a format that works for me. They just forgot to close with a bang... maybe next time. As awful as the recent Nintendo Directs have been. At least they didn't do the 10 year old rehash at the end as the "big closing"
The format is fine - content is the problem. I like what Sony did I just think that they didn't had much else to show. Maybe they'll improve this in time perhaps when the Final Fantasy VII remake and Shenmue 3 are close to release. Nintendo Direct are also starting to go downhill probably because of Iwata's passing and Reggie's retirement but I still enjoy those over this mediocre start with State of Play. Yeap I'll give them a year for this, if it truly turn to crap instead then I say Sony just didn't had the love or passion to do this. Needed a personality to introduce the videos, and they should have shown more gameplay, instead of so many cut scenes. Then, the game I most wanted to see, Vacation Simulator was only shown for a couple seconds, in favor of some big budget interactive movies. I'm gonna ask the question we all want answered... When's the next NDirect? State of Play was a boring livestream that blatantly ripped-off Nintendo's format without the actual substance. Nintendo Directs are cool because Nintendo can literally announce anything at anytime. The last indie Direct featured a Microsoft game and a wacky Zelda crossover, while the last real Direct featured a sequel to Mario Maker, a remake of a fan favorite Zelda, and the next Platinum IP. That's not to mention weird stuff like Tetris battle royale or surprises like a new Rune Factory. All for Switch too - no more focus on 3DS - unlike Sony's obsession with PSVR, a product that has a ~5% attach rate. translator voicovers are only taking place in the United States version because there is a notion that Americans do not like to read text while watching, The rest of the world has no voiceovers on Directs. You hear the original voice and you read the subtitles. ps: and lets end with this last century comment section where you have to answer to someone 10 kilometers away. @Zuljaras If you were a NL editor we'd only get one article a week. @nintendolie Maybe they anticipated the mixed reactions? Well, it was very underwhelming. It was mostly VR, and PSVR seems to be quite, well, unpolished at this time. The NindieShowcase, which was nothing but a NintendoDirect with indies, was lackluster in its presentation ( for me the hosts were horrible at best ), but State of Play had no presentation whatsoever. @N00BiSH yes that's what i meant "nintendo direct" <-> "state of play"
"Today we would like to bring you the | STATE | of Play. Please understand. We will not be attending E3 with a live show this year. We know you have been looking forward to us there, however, we have decided, instead, to bring you this video. We hope you will look forward to more of these presentations in the future. First, please take a look at this video of Hideo Kojima telling us about his new game. You may note, that Mr. Kojima has a new hair style!..." Some people said it was bad, They said Iron man VR looks bad. Despite them clearly saying not in game graphics,which could be a bad thing cause that means it could look worse. Some other really good looking VR games. And the best bit concrete genie which does support VR as well. It seemed like they where shoving vr down people's throats and saying buy it or risk not getting as many games or not as good game exp. But dam that concrete genie looks amazing. The format was fine, it just lacked content if you’re not a VR fan. It also lacked the big finish. No equivalent of A Link to the Past, Animal Crossing or Smash here. We can only hope that everyone starts doing Nintendo Direct Style Announcements. It is the best way to find out about new games. I have absolutely zero interest in VR. None. I don't find it cool. I don't find it fascinating. For that reason, State of Play bored me. PlayStation does similar things to Nintendo at times, but does it without the "magic." The NES Classic and SNES Classic were both amazing retro consoles. Sure they had some flaws (short cords, can't add games) but they pulled off what they were trying to do much better than the PlayStation Classic did. Same with Nintendo Direct. PlayStation might be the top video game brand right now, but they just don't have Nintendo's magic touch (or recognizable and popular IPs) and they likely never will. Sony copied Nintendo for good reason. Its better the entire industry moves towards frequent updates throughout the year rather than focus on one week at E3. And if I recall, Nintendo didn't get their first few Directs perfect either. I'm all for Sony following suit and am sure they will get better over time. But I can understand peoples frustration. There was too much PSVR in that presentation to ignore. @ThatNyteDaez There's good and bad. E3 I set the week aside for that to tune into everyone's presentations. I see everything they are wanting to show. With different individual presentations at random times through they year for each company, I'll probably end up just not following it. I can't be "ready" all the time for some random Sony presentaiton and some random Nintendo one. For now I'm just tuning into Nintendo ones and ignoring the others (that I wouldn't ignore at E3.) So for me, and probably others, they went from a known "hey it's early June I should check when E3 is and follow what everyone has coming!" to "oh, hey, I guess they announced stuff a few months ago, I didn't know." In a way it reinforces that they're only preaching to the choir, and not drawing anyone else in. IF you're not LOOKING for State of Play you don't know there's a new State of Play. Whereas at E3, if your'e a gamer, you know to check stuff out around then. Nintendo has that problem too, but Nintendo's so tied to their choir already it's not a huge difference. In the end I feel more out of touch with Sony and what they're doing as a result of this, and am not really following things I want from them now. Instead of preordering things i'll find out they exist a year after they release and get to pay half price. @Cosats wrote "translator voicovers are only taking place in the United States version"
I didn't realize this. I checked out the last Direct on the Nintendo UK YouTube site and you are correct. Maybe I'll watch UK Directs from now on. There's still something sucking the energy out of these videos though. Maybe it's the unnecessary voiceover narration for almost every game, telling you what you can already see on screen. The format is definitely a good idea and helps keep customers informed throughout the year. It seemed strange that they wouldn't plug Days Gone in the State of Play seeing as it releases next month. Going forward they should use it to highlight the big upcoming games (Ghosts, TLOU2, Death Stranding) and fill the rest of the time with smaller or VR games. I'm not sure how Sony will do going into the next gen. They've had an easy ride with the PS4 but with streaming networks looming and diminishing returns with tech they could have a harder time with the PS5 (outside of the UK). 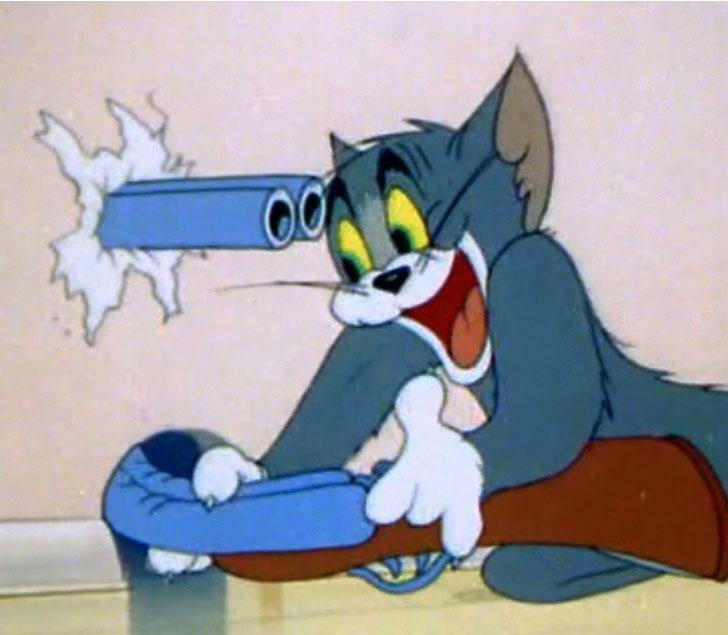 @CaPPa They showed a new trailer for Days Gone. @Phle this is a really good point! I get so many PlayStation emails I send them straight into a junk folder. I missed the presentation too! If you have PlayStation VR than it was a good presentation for you. Other than that it pretty much sucked lol. Move is largely useless as far as I can tell - except for Dreams! It's easy to forget that the PlayStation 2 did actually support motion control gaming via the PS Eye, which was cool!! Though Microsoft's Kinect improved on the PS Eye by adding depth sensing. PS Eye (and EyeToy on the PSP) also did AR. I still think games like Just Dance (etc.) are vastly superior on Kinect vs. WiiMote. Instead of Move I would have preferred that Sony keep working on motion controls and AR with the PS Eye. By the way, I'm not sure where the negative response to Sony's State of Play video are coming from. Other than being quite short it was solid imo--but maybe that's because they showed a bunch of cool VR games, and VR is mostly all that truly excites me in gaming right now. The presentation itself wasn't bad. The timing and the absence of a small warning upfront was. Sony has been really quiet since last year. Anticipation for games like The Last of Us 2 and Ghost of Tsushima is through the roof. And then they went ahead and showed a bunch of VR games... Great... Had Sony announced in advance that "State of Play" will their new communication format from now on and that the first presentation would mainly focus on PSVR games, it would have gone over much smoother. Better next time Sony. I think the Nintendo's approach is much better at keeping it light and fun, which is what presentations about entertainment and gaming should be like. I liked this controller on the Wii/Wii U and wish there were a Switch version! @Alex If you own a PS2, you have a console that can run Final Fantasy VIII. And Tactics. And Persona 3 and 4. P4 was one of the last great games on the PS2 and should be fairly playable today. Respect for XBox. Shame for PlayStation.